Officer Cameron Harrison recently became the 12,000th member of the North Carolina Police Benevolent Association. The Police Benevolent Foundation and the Southern States Police Benevolent Association are ready to help law enforcement officers and their families that may be affected by Hurricane Florence. Unlike most, a police officer?s job can never really be put on hold when disaster strikes. They are required to work through the worst conditions and be ready and able to help others. The North Carolina PBA held a press conference on Monday, August 21, 2018 in Greenville, NC regarding concerns of Greenville law enforcement officers. In response to egregious continued efforts to interfere with the efforts of Greenville police officers to enforce state and local law and to protect the citizens of Greenville, several of those police officers have filed a lawsuit today against Kandie Smith individually and in her official capacity as a member of the City Council of Greenville for tortious interference with their contracts of employment and obstruction of justice, among other causes of action. North Carolina PBA and the local PBA membership stand with these Greenville officers as they challenge the improper actions of Ms. Smith. Brian DiYorio was recently elected President of the Catawba River Chapter. On July 30th, the North Carolina Police Benevolent Association presented their Legislative Excellence award to Representative Bob Steinburg in the House Chambers. Rep. Steinburg has been a tireless advocate for prison reform and correctional officers. His efforts led to an increase to the survivor benefit for law enforcement officers killed in the line of duty from $50,000 to $100,000. It would also make correctional officers eligible for the same benefit and be retroactive to cover the deaths of the officers from Bertie and Pasquotank Correctional Institutes. On June 25, 2018, the NCPBA held a press conference in Raleigh, NC to announce the filing of a lawsuit on behalf of our members against the Department of Public Safety. This suit has been filed due to what we believe to be a deliberate and pervasive scheme by DPS administrators to deny benefits to our members that were supported and passed into law by state legislators. Please read an open letter to our members concerning Murphy's Law! Carla Elkins and Eric Brainard prepared and presented a presentation in downtown Elizabeth City on Friday, March 23, 2018 at the waterfront gazebo to honor the fallen officers of Pasquotank Correctional Institution. The families of the murdered Pasquotank Correctional employees? families were honored with memorial shadow boxes. It was a small outdoor program to honor and show support for the Pasquotank Correctional employees who lost their lives from the incident on October 12, 2017. In Tully v. City of Wilmington, N.C., 790 S.E.2d 854 (N.C. App. 2016), aff'd in part, rev'd in part, 2018 WL 1124796 (No. 348A16), the North Carolina Supreme Court issued themost powerful and sweeping police employment decision of the new millennium. On February 16th, Eva Howard received her Advanced Law Enforcement Certificate from the NC Criminal Justice Education and Training Standards Commission. The presentation was part of the Commission's regular meeting that was held at the Wake Tech Law Enforcement Training Center in Raleigh. The Advanced Law Enforcement Certificate is awarded to officers for achieving the highest level of excellence through education, professional training, and on-the-job experience. On March 22, 2018, one of our members, Officer Tony Minchella received the Crisis Intervention Team Officer of the Year Award for the Holly Springs Police Department. On January 25th, the NCPBA was present at the Joint Oversight Committee on Justice and Public Safety meeting at the General Assembly. They met to hear an update on prison reform from North Carolina Department of Public Safety Secretary Erik Hooks. Hooks was supported by numerous staff in his presentation and members of the committee asked a wide array of questions. In the latest issue we learn how the Post Critical Incident Seminars are saving officers' lives, careers and marriages; honor the memory of fallen Sergeant Meggan Callahan while working to improve corrections officers' working conditions; rock out with Chris Lane; and many more interesting topics. North Carolina Division President Randy Byrd recently wrote a letter to Governor Cooper regarding the interim Deputy Director position with the NC Prison System. The NCPBA offers rebuttal of Daily Advance Editorial. 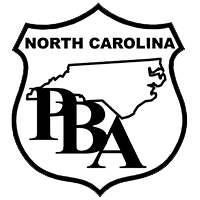 On Thurdsay, October 19th, the PBA was on hand in Advance, North Carolina to receive a donation of $1,500 for the Police Benevolent Foundation. Moyer, West and Associates held their annual golf tournament for clients at Bermuda Run Country Club and wanted to make a donation as part of the event. The North Carolina Police Benevolent Association is supporting Representative Bob Steinburg's efforts to create legislative oversight of the North Carolina prison system. In April of this year, Sgt. Meggan Callahan was brutally murdered at the Bertie Correctional Institute. Recently correctional officers and staff were injured and killed in an attempted prison break at Pasquotank Correctional Institution. The work and tragedy of Sergeant Meggan Lee Callahan has been recognized far and wide. PBA is presently litigating a case before the North Carolina Supreme Court involving a correctional officer who was wrongfully fired. On September 18th and 19th John Randazzo, Chris Wade, Sam Hodapp, Derik Queen, Gavin Aron, Rob Moore, Jonathan Barnes, Mike Collins, Daniel Johnson, Tyler Medlin, and Tom Slymon screened municipal candidates for Huntersville and Cornelius Commissioners at the Courtyard Marriott in Huntersville. Trooper Matthew B. Brown, a North Carolina State Trooper, is the NCPBA?s 11,000 member. The State Law Enforcement Officers Chapter of the North Carolina Police Benevolent Association is one of the most diverse chapters in the State. These law enforcement professionals have vast experiences in many different regulations. Some officers inspect for fisheries or hunting violations, while others safeguard the general assembly, to others that specialize in transportation or investigations. The North Carolina Police Benevolent Association recently presented their 'Legislative Excellence' award to several legislators for their unwavering support for law enforcement and the values of the PBA. The North Carolina PBA is proud to announce the appointment of PBA leaders David Rose and Randy Byrd to the NC Criminal Justice Education and Training Standards Division. On 6-27-16, the NCPBA was proud to be on hand as House Resolution 924 was introduced by Rep. Bob Steinburg to honor the life of PBA member and Corrections Sgt. Meggan Callahan who was killed in the line of duty on April 26, 2017. In what was a historic day for municipal police officers in North Carolina, the PBA was present as HB37 (Protect Law Enforcement Officers) passed the House on April 27th. HB37 is a bill that will protect municipal officers from retaliation when they report corruption. The NCPBA is proud of Rep. Nelson Dollar for introducing this bill to support the families of of our fallen Public Safety Heroes! Rep. Dollar is a fierce advocate for law enforcement and has been a long time PBA supporter! Thank you Rep. Dollar! PBA goes above and beyond the call for help! The mission of the SSPBA is to be ?The Voice of Law Enforcement Officers.? This means when PBA members ask for help, they have the assurance of support from the PBA during difficult situations. A PBA member who is very grateful for his membership and the work of the PBA is Rick Anderson from Hixson, TN. In the latest issue we cover 10 things to remember after an officer-involved shooting, learn about the Alabama member back to work after being cleared of charges, meet the MSPBA member awarded the purple heart medal, and many more interesting topics. The North Carolina Police Benevolent Association represents more than 10,000 law enforcement professionals. Our members are very disappointed that in announcing his new Director of Public Safety, Governor Cooper indicates that his first law enforcement priority. Dear Members: I want to take this opportunity to welcome you to our General Election newsletter. There has never been a time in my career where law enforcement officers were being treated with less respect and fairness. That is why this newsletter is so important. For the past several months, PBA members have volunteered their time to conduct interviews of candidates running for every statewide office and the General Assembly. These candidates have been asked the tough questions to include their views on numerous issues such as: due process, whistleblower protection, first amendment protection, privacy of personnel files, appointments, and preservation and strengthening of the retirement system. This is a list of the endorsed candidates that the NCPBA has endorsed in 2016. We would like to congratulate each of these candidates on their endorsements and we hope to work with them into the future to help make the law enforcement profession better for our members. Please show your support for these candidates at the polls. The North Carolina Police Benevolent Association recently held a series of candidate interviews for those candidates seeking election to the North Carolina Supreme Court and Court of Appeals. During the screening process, the following candidates demonstrated why their experience and values make them uniquely qualified to represent the voters of North Carolina. They also demonstrated that they are committed to the rule of law and making fair and impartial decisions from the bench. On September 9, 2016, officers from around the United States went with TACTICA (Teaching Authorities Christian Truth in Central America) Ministries to Ecuador to train officers and spread the gospel of Jesus Christ. The officers being trained were an elite unit in the Ecuadorian National Police called Grupo De Operaciones Especiales (GOE).Part of this year?s group was Brandon McGaha, Senior Vice President of the North Carolina State Division of the SSPBA and President of the North Carolina Mountain Chapter. The North Carolina Police Benevolent Association has chosen to endorse Elaine Marshall for Secretary of State. As Secretary of State, Elaine has received international recognition for her efforts to protect copyrights and deter counterfeit goods. Oak Island Police Officer Patrick Higgins recently became the 10,000 member of the North Carolina Police Benevolent Association. Eva Howard was recently appointed Legislative Chairperson by Division President Randy Byrd. As part of her role, she will lead a committee of fellow members working towards passage of the division's legislative agenda in General Assembly. The North Carolina Police Benevolent Association recently held a series of candidate interviews for those candidates seeking election for various offices. During the interview process, Linda Coleman demonstrated why her experience and values make her uniquely qualified to represent the citizens of North Carolina. Linda Coleman also demonstrated to the North Carolina PBA that she is committed to making strong, effective law enforcement a priority in her campaign. The North Carolina Police Benevolent Association recently held a series of candidate interviews for those candidates seeking election for various offices. During the interview process, Dr. June Atkinson demonstrated why her experience and values make her uniquely qualified to represent the citizens of North Carolina. The Police Benevolent Foundation (PBF) and the North Carolina PBA are rallying behind Hendersonville Police Lieutenant, Dale Patton, as he bravely battles cancer. Lt. Patton is a 12-year veteran of the Hendersonville Police Department and is greatly loved by his fellow law enforcement officers. The North Carolina Police Benevolent Association (NCPBA) has endorsed the North Carolina Commission on the Administration of Law and Justice (NCCALJ) Criminal Investigation and Adjudication Committee?s initial recommendation to raise the age of juvenile court jurisdiction in the state to include youthful offenders aged 16 and 17 years old for all crimes, except Class A through E felonies and traffic offenses. The North Carolina Police Benevolent Association recently held a series of candidate interviews for those candidates seeking election for various offices. During the interview process, Governor Pat McCrory demonstrated why his experience and values make him uniquely qualified to represent the citizens of North Carolina. The North Carolina Police Benevolent Association recently held a series of candidate interviews for those candidates seeking election for various offices. During the interview process, Beth Wood demonstrated why her experience and values make her uniquely qualified to represent the citizens of North Carolina. Today, the North Carolina Court of Appeals has issued a thundering decision in support of constitutional rights of police officers. In Tully v. City of Wilmington, the Court ruled that North Carolina municipalities are constitutionally required to honor and obey their own personnel policies. The North Carolina Police Benevolent Association recently held a series of candidate interviews for those candidates seeking election for various offices. During the interview process, Charles Meeker demonstrated why his experience and values make him uniquely qualified to represent the citizens of North Carolina. The North Carolina Police Benevolent Association recently held a series of candidate interviews for those candidates seeking election for various offices. During the interview process, Wayne Goodwin demonstrated why his experience and values make him uniquely qualified to represent the citizens of North Carolina. The North Carolina Police Benevolent Association recently held a series of candidate interviews for those candidates seeking election for various offices. During the interview process, Dale Folwell, CPA demonstrated why his experience and values make him uniquely qualified to represent the citizens of North Carolina. t is with a heavy heart that we are once again grieving the tragic loss of three of our own at the hands of pure hatred. The North Carolina Police Benevolent Association recently held a series of candidate interviews for those candidates seeking election for various offices. During the interview process, Josh Stein demonstrated why his experience and values make him uniquely qualified to represent the voters of North Carolina. Our thoughts and prayers go out to the City of Dallas and all those affected by last night?s tragic events. NCPBA Raleigh Chapter President Jamie Rigsbee recently spoke on behalf of Raleigh PD officer pay raises. On June 2nd the North Carolina PBA interviewed candidates seeking election/re-election to the NC Court of Appeals in Cary. The candidates were asked a series of questions related to state constitutional claims, constitutional interpretation, due process, 1st amendment protections for law enforcement officers, privacy of law enforcement personnel files, and equal protection and arbitrariness claims. NCPBA Executive Director, John Midgette and his family of law enforcement officers are profiled. Learn more about the proud, blue-blooded Midgette family, here. The Honorable Craig Croom was recently presented with the Judicial Excellence Award at the North Carolina Police Benevolent Association at the 10th annual ?George Almond? Officer of the year banquet on February 20, 2016. In 2011, Delia D'Ambra received the Police Benevolent Foundation Scholarship. We decided to catch up with her and see how the scholarship helped in her academic pursuits and what she's up to these days. The Police Benevolent Foundation and the Virginia Division Police Benevolent Association are rallying behind the family of fallen officer, Ashley Guindon, as well as wounded officers, Jesse Hempen and David McKeown. On Saturday, February 27, 2016 officers Hempen, McKeown and rookie officer, Guindon responded to the home of Army Staff Sergeant, Ronald Hamilton. Hamilton had just shot and killed his wife and proceeded to shoot at police as they arrived. The North Carolina Police Benevolent Association recently held a series of candidate interviews for those candidates seeking election for various offices. During the interview process, Jim O?Neill demonstrated why his experience and values make him uniquely qualified to represent the voters of North Carolina. NC Mountain Chapter President and NCPBA Sr. VP, Brandon McGaha was named Officer of the Quarter. Learn more about Brandon and his work with the Adhoc Community Enhancement team and the Hendersonville Police Department. The PBA has long held the reputation for educating the public about the daily work of law enforcement officers and the sacrifices they make to keep their communities safe. Through these education efforts many relationships with the community have led to partnerships that have benefited members of the PBA. The PBA also has an extensive history for creating solid and sustainable relationships with elected officials to effect positive change for their members. The Police Benevolent Foundation (PBF) and the North Carolina Division of the Southern States PBA would like to express their deepest sympathy and compassion to the family, friends and fellow law enforcement officers of Asheville Police Department Sergeant Jonathan Rikard. Sergeant Rikard died on Wednesday, December 9, 2015. Sergeant Rikard had served with the Asheville Police Department since June of 2003 and is survived by his wife, Nicole, and son, Tucker. In this issue we discuss how politicized indictments are threatening the legal safety of officers, 5 notorious outlaws from Alabama's wild west days, how the NCPBA assisted an embattled police department in selecting a new chief, as well as many other things. This is a list of all of the endorsed candidates that the NCPBA has endorsed in 2015. We would like to congratulate each of these candidates on their endorsements and we hope to work with them into the future to help make the law enforcement profession better for our members. Please show your support for these candidates at the polls. Chief Justice Mark Martin today convened the inaugural meeting of the N.C. Commission on the Administration of Law and Justice (NCCALJ) to begin evaluating the ability of the court system to continue meeting and adapting to the needs and expectations of the people it serves. He charged the commission with conducting a thorough review of North Carolina?s Judicial Branch and determining a plan to strengthen the courts. On August 28, 2015, Chapter leaders met in Cary for their division meeting and to select officers for a three year term. Randy Byrd who serves as the Cary chapter President was elected to serve another three year term as President. Chief Justice Mark Martin has announced the full membership of the newly created North Carolina Commission on the Administration of Law and Justice and has appointed North Carolina Police Benevolent Association President Randy Byrd to the Commission. Raleigh Chapter member John Matthew "Matt" Midgette awarded the Raleigh Police Department's Distinguished Service Medal. The Police Benevolent Foundation and the North Carolina Police Benevolent Association are rallying behind Cornelius Police Officer and PBA member, Lieutenant James Quattlebaum, who is currently in recovery after being shot in the line of duty. Does the LEOSA Carry Law Apply to You? The law is not as cut-and-dried as you think. And much of what you hear about it is wrong. I am very thankful for the assistance that PBA provided for me during my time of need. I cannot imagine what I would have done or what would have happened to me if PBA would not have been there to help me. My family and I cannot begin to express our thanks for the wonderful support that was given to me during the time I needed it most. I am so thankful that I was led to this organization by other members because there is no possible way I would have been able to fight this battle on my own. The North Mecklenburg Chapter of the North Carolina Police Benevolent Association (NCPBA) is coordinating a canned food drive on Saturday, December 20th from noon to 5 p.m., at the Wal-Mart in Huntersville, NC (11145 Bryton Town Center Drive.) Off-duty police officers from Huntersville and Davidson will be collecting canned goods in front of the store to benefit the Ada Jenkins Center and the Angels and Sparrows Soup Kitchen. Officers will fill the Huntersville Police Department?s colorful DARE Truck with donations from shoppers. It was packed at the City Council meeting Tuesday night -- both officers and their family members wanted to see how the City would address the recently exposed issues with the Asheville Police Chief. The North Mecklenberg Chapter of the North Carolina Police Benevolent Association recently held a series of candidate screenings for those candidates seeking election for various offices. During the interview process, Charles Jeter and John Bradford demonstrated why their experience and values make them uniquely qualified to represent the voters of District 92 and District 98. The North Carolina Police Benevolent Association is committed to keeping you informed of legislation that may affect your work-life, pay and benefits. Recent developments within the Asheville Police Department have prompted the state?s largest law enforcement association to again call for passage of Whistleblower Protection legislation for local officers. Every year the Police Benevolent Foundation awards division scholarships to deserving students through-out the southeastern United States. The pool of division scholarship applicants come from the children of PBA members. As part of the PBA?s core mission we strongly believe in advocating for our members in multiple forums. This includes our endorsement of candidates seeking various offices. Nowhere is this more critical than the North Carolina Court of Appeals and Supreme Court. In this issue we discuss what you should be careful about when posting to social media, one PBAGA member's path to sobriety, and how to respond if you're the target of an investigation. The Mountain Chapter of the North Carolina Police Benevolent Association recently held a series of candidate screenings for those candidates seeking election for various elected offices. During the interview process, a number of endorsed candidates demonstrated why their experience and values make them uniquely qualified to represent the voters. The North Carolina Police Benevolent Association (NCPBA), the largest law enforcement association representing officers in Wake County and North Carolina, has endorsed Lorrin Freeman for Wake County District Attorney. The Wake County District Attorney is the top law enforcement officer and head prosecutor in one of the most critical judicial districts in the state. We salute Halifax County Sheriff's Office K-9, Brody. After 3 1/2 years of work. Brody is now retired due to a medical condition. Brody's handler, Deputy Sheriff Jason Keeter, was well dedicated in the care and training of Brody. As a part of Brody's retirement, he is now personally owned by Jason who continues to care for him. The North Carolina Police Benevolent Association is committed to keeping you informed of legislation that may affect your work-life, pay and benefits. The Governmental Affairs department will be providing periodic updates on the actions of the North Carolina General Assembly while in session. Included is a summary of bills of interest introduced during last month, as well as updates on those reported in the previous reports. On June 2, 2014, the Cary chapter partnered with Jersey Mike's to raise funds for the PBF. After discussions Melissa Daniels and Cary chapter President Randy Byrd, Jersey Mikes decided to designate a day as PBF day and donate 20% of the earnings to the Foundation. The Police Benevolent Foundation (PBF,) Inc. and the North Carolina Police Benevolent Association (NCPBA) are rallying behind Huntersville Police Officer and PBA member, Brian Luthart, whose three-year-old son, Griffin, was severely burned when an outdoor oil torch suddenly exploded near him. The North Carolina Police Benevolent Association is committed to keeping you informed of legislation that may affect your work-life, pay and benefits. The Governmental Affairs department will be providing periodic updates on the actions of the North Carolina General Assembly while in session. Fayetteville's effort to establish a Citizen Review Board for the Police Department will be delayed at least until 2015. For several decades, the PBA has conducted interviews of candidates for the North Carolina Supreme Court. These interviews help PBA members identify the most qualified candidates by evaluating their responses, qualifications, judicial record, and their respect for traditional constitutional values. The Mountain Chapter of the North Carolina Police Benevolent Association recently held a political screening for those republican candidates running for Sheriff of Henderson County. This is a list of all of the endorsed candidates that the NCPBA has endorsed in 2014. We would like to congratulate each of these candidates on their endorsements and we hope to work with them into the future to help make the law enforcement profession better for our members. Please show your support for these candidates at the polls. More than 500 runners donned a wide array of glow-in-the-dark gear, largely blue in keeping with the event?s theme, for a night run over a three-mile course that began and ended in front of the Polk County Courthouse. Music played, the scent of barbecue filled the air and runners of all ages did their part to help raise funds for a worthy cause. Curtis Jenkins of Forsyth, Georgia, has been nominated for election to a third term on the National Rifle Association Board of Directors and your help is respectfully solicited. The Police Benevolent Foundation, Inc. and the Mississippi Division of the Southern States PBA are rallying behind the family of Union County Sheriff?s Deputy Clinton Frazier. Frazier was killed in a single vehicle accident on December 18th. Deputy Frazier had served with the Union County Sheriff?s Office for two years and is survived by his wife and three children. He was a beloved officer who will be missed tremendously by the Union County Sheriff?s Department, as well as other surrounding law enforcement agencies. The Police Benevolent Foundation?s Race for the Fallen (R4TF) race series was created to honor the hardworking and dedicated members of our law enforcement community who risk their lives to protect our cities. These officers are men and women who have taken an oath to ?protect and serve? the local citizens and their communities. The R4TF 5K Glow Run event recognizes the contributions and sacrifices made by not only the officers, but also their families. The Police Benevolent Foundation, Inc. and the Mississippi Division of the Southern States PBA are rallying behind the family of Eupora police officer Keith Crenshaw. Crenshaw died from injuries he sustained while deploying a spike strip across Highway 82 in an attempt to stop a car carrying three robbery suspects Wednesday morning. The suspects saw the spike strip before arrival and veered into the median where Crenshaw had moved after deploying the strip. The Cary Chapter of the North Carolina Police Benevolent Association recently hosted candidate interviews for those seeking election/re-election to the Cary Town Council. In this issue we discuss the PBF's Behind the Badge seminars surrounding police suicide and PTSD and how one member's injury was not going to keep him down. This is a list of all of the endorsed candidates that the NCPBA has endorsed in 2013. We would like to congratulate each of these candidates on their endorsements and we hope to work with them into the future to help make the law enforcement profession better for our members. Please show your support for these candidates at the polls. As the Memorial Day Weekend is upon us the following letters to legislators on various PBA and related bills is provided as a barometer of our efforts to date in the General Assembly. The Police Benevolent Foundation, Inc. and the Virginia Division of the Southern States PBA are rallying behind Alexandria Police Officer Peter Laboy who was shot on February 27th after making a routine traffic stop in Alexandria. The bullet struck Officer Laboy in the head, critically injuring him. Officer Laboy was flown to Medstar Washington Hospital where he remains in critical condition. In light of all the recent gun control debates arising in America today, the Southern States PBA would like to display our support for the 2nd Amendment of the Constitution. This is our official stance on the matter. The 7th annual awards banquet will be held at the Cypress Manor in Cary on March 9, 2013. Registration is from 5 to 6 p.m. For full details on the event and to purchase tickets or to serve as a host or sponsor please read on. On January 30, 2013, NC PBA Leaders from across the state attended the 2013 Legislative Reception honoring members of the 2013 General Assembly hosted by the Association Executives of North Carolina at the North Carolina Museum of Natural Sciences. The Southern States PBA served as a sponsor of the event. On February 12, 2013, the NC PBA secured a Police Benevolent Foundation donation from Belcan Staffing. Belcan Staffing Solutions is a division of Belcan Corporation, a private, woman-owned global service provider with over 11,000 employees in over 65 offices and design centers worldwide. In a blink of an eye life can change dramatically. That is exactly what happened on October 14, 2012 to Officer Bruce Potter and his family: a loving wife and two children. The North Carolina Police Benevolent Association is currently holding two separate raffles for sports memorabilia items to benefit the Police Benevolent Foundation. On December 6, 2012, Cary Chapter and NCPBA Division President Randy Byrd was invited to speak to the Kildare Rotary Club in Cary about the PBA and PBF. This invite came through Chase Wellford who is the brother of PBA member Courtney Wellford. For a number of years, Chase has attended the George Almond Officer of the Year Banquet with his sister and parents. Each time he attended he came away impressed with the work that the PBA and PBF were doing to help officers. On Thursday January 3, 2013 the North Carolina Police Benevolent Association was part of a select group of distinguished guests that were invited to attend the Investiture of Cheri Beasley as Associate Justice of the North Carolina Supreme Court. My family traditionally take a Christmas vacation that consist of a scavenger hunt for the kids. My wife mails clues in a gift wrapped box all over the eastern United States to people who willing to help hide the gifts (clues). Every once in a while we get little notes like these praising the services we offer here at the PBA. The North Carolina Police Benevolent Association and plaintiffs in the existing consent search litigation have decided to temporarily withdraw and voluntarily dismiss without prejudice the existing civil and civil rights action against the City of Fayetteville regarding the City's action in preventing Fayetteville police officers from performing consent searches as a part of their law enforcement duties. A dismissal without prejudice means that the action can be refiled. The North Carolina Police Benevolent Association was very pleased to learn of the appointment of Judge Cheri Beasley to the North Carolina Supreme Court to replace retiring Justice Patricia Timmons-Goodson. The Southern States Police Benevolent Association proudly announces that it has reached a membership milestone of 30,000 members. The association, founded in 1986, has grown by more than 10,000 members since 2004 and membership continues to steadily increase. Fairfax County Chapter (VAPBA) board member, Matthew Siraguse shares is story of how wearing his seat belt in his patrol car saved his life. The North Carolina Police Benevolent Association (NCPBA) is pleased to announce support for our member, police officer Kevin Smith, in his fight to stop the Town of Navassa from taking and likely putting down, Luci, the officer's former police K-9 and beloved family pet. As a part of PBA's core functions for over twenty years, we have objectively evaluated judicial candidates for our appellate courts. Our judges on the North Carolina Supreme Court and Court of Appeals make important decisions that profoundly affect law enforcement and our lives. The North Carolina division of the Southern States PBA and Outback Steakhouse has combined its efforts to raise funds for two very worthy causes - The Friedreich's Ataxia Research Alliance (FARA) and The PBF's Fallen Officer Fund. The Mountain Chapter of the North Carolina Police Benevolent Association recently held a series of candidate screenings for those candidates seeking election for various elected offices. On September 29, 2012, Chapter leaders met in Cary for their division meeting and to select officers for a three year term. The 2nd Annual Race for the Fallen Half Marathon was a huge success. The race had almost 200 participants and raised significant funds to benefit the Police Benevolent Foundation. On August 25, 2012, the North Carolina Police Benevolent Association and the Bladen County Sheriff's Office hosted a fundraiser to benefit the family of Dewayne Hester. Brandon McGaha, a native of Henderson County, North Carolina, began his law enforcement career with the North Carolina Department of Corrections in 2000. The Police Benevolent Foundation is proud to announce the recipients of its 2012 scholarships. These outstanding students have demonstrated academic excellence and deserve to be recognized. North Carolina Division President Randy Byrd was recently appointed by Governor Perdue to serve a two year term as a member of the Board of Trustees for the Local Governmental Employees' Retirement System. So You Joined PBA Just For Legal Defense Benefits? If you are like many officers who joined PBA just for the Legal Defense Benefits and are not active in the association you're missing out. As so wisely said by someone before me "Having PBA membership just for legal defense benefits is like having a Porsche that you only drive in 2nd gear, you'll never realize what it can really do." While the legal defense benefits of PBA membership are first rate in every respect, PBA is a whole lot more than just legal defense. If you're serious about wanting to make positive changes in your work environment and benefits, listen up. SB 580 gives you the voluntary option of converting your 401k funds at the time of your retirement. This would allow you to have an increased retirement benefit, immediate payout at retirement (where as 401k funds are not available without penalty until age 59 Ã‚Â½ ) and would qualify your total combined retirement benefit for regular COLA increases as passed by the General Assembly. In this issue we discuss the implementation of the new structure of the SSPBA, we meet the new president of the Southern States PBA and take a deeper look into the Police Benevolent Foundations "I wish you knew" campaign. The North Carolina Police Benevolent Association met with elected officials in Raleigh Monday to make suggestions regarding the proposed Fayetteville Citizens Review Board. Representative Rick Glazier proposed a series of amendments which the NCPBA felt would help protect the privacy of Fayetteville police officers and ensure fair treatment and transparency in the Citizen Review Board procedure. The Police Benevolent Foundation, Inc. and the North Carolina Division of the Southern States PBA are rallying behind the family of Bladen County Sheriff's Deputy Dewayne Charles Hester who died after a car crash while responding to a call on Friday, June 8, 2012. Deputy Hester was 39 years old and leaves behind his wife and two children. The 2012 SSPBA annual board meeting was held on Friday, June 8, 2012 in McDonough, GA at the Hilton Garden Inn. Board members received reports from each PBA department head, discussed policies and elected a new SSPBA Executive Board. Appearing as a request from the Fayetteville delegation of locally elected officials as an effort to promote city-police relations, SB 939 is intended to do just the opposite. This is a list of all of the endorsed candidates that the NCPBA has endorsed in 2012. We would like to congratulate each of these candidates on their endorsements and we hope to work with them into the future to help make the law enforcement profession better for our members. Please show your support for these candidates at the polls. The Police Benevolent Foundation, Inc. and the North Carolina Division of the Southern States PBA are rallying behind the family of Correctional Officer William Wright. The Southern States Police Benevolent Association, Inc. and the Police Benevolent Foundation, Inc. have officially launched the I Wish You Knew campaign, a nationwide awareness campaign to educate the public about the adversities law enforcement officers and their families face every day. The PBA's endorsement of judicial candidates continues to be the most comprehensive and successful process of any law enforcement association effort. PBA endorsed judges continue to make landmark decisions that are improving conditions for North Carolina law enforcement officers. While federal courts were once the primary forum for adjudicating constitutional and civil rights claims of law enforcement officers, federal courts have become hostile to officers in many areas of law. The Southern States Police Benevolent Association is committed to keeping you informed of federal legislation that may affect your work-life, pay and benefits. The Governmental Affairs department will be providing periodic updates on the actions of Congress while in session. Included is a summary of bills of interest introduced during this past month, as well as updates on those reported in the previous report. Reporting of these bills are information purposes only, to you as a PBA law enforcement professional, and do not reflect the PBA's support or opposition on any specific bill. Ever since the earliest police forces were established, the schedules and hours that police officers work have been an issue of concern to officers and chiefs. Driving these concerns have been issues of safety, health, performance, quality of life, fatigue, and efficiency. Traditionally, police departments have relied on a five-day, eight-hour scheduling framework with three standard shifts (day, evening, midnight) in each twenty-four-hour period. However, since at least as early as the 1970s, law enforcement agencies have adopted alternate schedule configurations. Compressed workweek schedules (CWWs), in which the workweek is shortened and the length of the day is extended, have indeed been popularized in the last several decades in many industries, including policing. According to preliminary data from the National Law Enforcement officers Memorial Fund, 173 officers have been killed during 2011 - up 13 percent from 153 line-of-duty deaths in 2010. As 2011 comes to an end, take a look at some of the changes we have highlighted since the last update. Not much has changed with the 112th Congress since our last update. Take a look at some of the changes we have highlighted since the last update. George Almond of Cary knows about the fear, pain and long recovery that lie ahead for Roanoke Rapids Police Officer John Taylor, who was shot by a suspect during a traffic stop Wednesday afternoon. The Blue Review is a yearly magazine published by the Southern States PBA. The Blue Review focuses on the PBA's accomplishments and details the work that the Police Benevolent Foundation is accomplishing. SSPBA has sponsored, supported or authored more legislation in North Carolina than all the other North Carolina law enforcement groups combined. Following is a history of SSPBA's legislative activities in North Carolina General Assembly. The official web site of the North Carolina General Assembly. Use this web site as a tool to track bills, find and communicate with your State House and Senate representatives, and to follow meetings and issues before the General Assembly. A thank you letter from NCPBA member Matt Long. The PBF and the Albemarle Chapter of the NCPBA would like to thank local Realtor, Dawn Midgette with a plaque, in appreciation of her donating her beach house back in May 2011 to the PBF at the Cary, NC fundraiser. Under the Dome is your inside source on North Carolina politics and government. The North Carolina Police Benevolent Association recently presented a plaque of appreciation to Rep. Shirley Randleman for her efforts in passing HB 538 into law. The Police Benevolent Foundation recently presented a plaque of appreciation to employees of Stella Nova Technologies Inc. in Wake Forest, NC. Stella Nova Technologies is a growing technology company comprised of seasoned retail professionals working alongside experienced developers of point-of-sale, web and other applications designed for the retail environment. The plaque presentation was for a $250 donation that the company had made to the PBF. The Police Benevolent Foundation and the Cary Chapter of the North Carolina Police Benevolent Association are rallying behind PBA member and fellow officer Chad Penland. He was involved in an on-duty motorcycle accident on July 15th and hospitalized for his injuries. The Cary chapter hopes to alleviate some of the expenses for his family as they support Chad and his recovery efforts. In May of this year, the Police Benevolent Foundation held a raffle that raised $5,000 to support Foundation initiatives. A baseball jersy signed by Atlanta braves great Chipper Jones and a Sports Ilustrated cover signed by Texas Ranger star Josh Hamilton were secured by the NCPBA. In an unprecedented move, Eddie Caldwell the Executive Vice President of the NC Sheriff's Association, tried to highjack a disability bill for law enforcement officers in order for him to receive a local government retirement. Following last week's derailment of HB 602, LEO Fairness Act, it was thought that the North Carolina Sherif's Association (NCSA) opposition to PBA sponsored legislation was through. Not so. On Friday, December 3, 2010, NCPBA President, Randy Byrd, met with Laura Falanga in Raleigh to receive a $1,000.00 check from the Wake Chapter of the Independent Insurance Agents of North Carolina (IIANC). This donation was made possible through the efforts of local chapter members. As reported last week, following opposition to the LEO Retirement Restrictions in HB927, the bill sponsor, Representative Dale Folwell, proposed a meeting with group stakeholders for this past Tuesday, June 7, 2011. That meeting did occur for about two hours beginning at 10:00 a.m. in Representative Folwell's office. A second meeting on HB 927 was held on June 3, 2011, in the House committee on State Personnel from 10:00 a.m. - 12:00 p.m.
On January 30, 2011, the Police Benevolent Foundation and the Cary Chapter of the North Carolina Police Benevolent Association partnered with Bunkey's Car Wash in Cary to raise money for fellow officer and PBA member Matt Long. Greg South, the President of the Albemarle Chapter recently attended leadership training at SSPBA headquarters in McDonough, GA. on March 23 and 24th. This training is part of meeting chapter compliance requirements along with giving PBA leaders valuable insight into the history and operations of the organization. On February 26, 2011, Susan Moran, the Public Information Director for the Town of Cary, made comments to WRAL-TV about a complaint that had been filed against officers of the Cary Police Department. Susan Moran made the following comments in the story. "We take it extremely seriously. On November 9, 2010, the Army Golden Knights based out of Fort Bragg, North Carolina invited a group of survivors of officers killed in the line of duty to make a jump of a lifetime at Laurinburg-Maxton Airport in Maxton, NC. There were 81 bills of interest followed during the 111th Congress. Of these bills, 54 were introduced by the House, and 27 by the Senate. Most died in one committee or another. But a few did manage to pass the Congress and get signed into law by the President. Most notably, was Senate Bill 1132. NC Advisory Board Members Natalie Perkins and NCPBA President, Randy Byrd, met with Laura Falanga in Raleigh to receive a $1,000 check from the Wake Chapter of the Independent Insurance Agents of North Carolina (IIANC). This donation was made possible through the efforts of local chapter members. This is a list of all of the winning candidates that the NCPBA endorsed in 2010. We would like to congratulate each of these candidates and we hope to work with them into the future to help make the law enforcement profession better for our members. On July 31, 2009, HB 816 was signed into law by Governor Beverly Perdue. This bill was introduced at the request of the PBA by Rep. Tricia Cotham. Rep. Nelson Dollar, Rep. Marian McLawhorn and Rep. Jennifer Weiss also joined the bill as primary sponsors at the request of the PBA. As a direct result of the PBA candidate screenings held in August of 2003, The Town of Cary now has a K-9 program. During the 2006 legislative short session a very important piece of legislation was passed into law and signed by Governor Mike Easley. Before H.B. 447, North Carolina local government police officers shot or otherwise injured feloniously, in the line of duty, could have their retirement contribution withheld and the employment time extended for the period they were recovering from their wounds/injuries.